Luckily for anybody with a fly problem, the truth is, excepting in cases such as agriculture or large hotel / restaurant kitchens, getting rid of flies is actually pretty easy. The only times where we would advise the use of professional help in eliminating a fly infestation is when livelihood or health is at great stake. In areas such as hospitals where diseases are both more dangerous and more common and in restaurants and other services where the number of people present is large, getting rid of a fly infestation as fast as possible is of paramount importance. In addition, getting rid of flies in agricultural settings can be a more difficult challenge. While this can still be achieved without hiring help, acting quickly and decisively in these situations is a must. There are dozens of methods and ‘tricks’ used to get rid of flies. As in all other cases, we suggest an integrated pest management approach, which involves a mixture of natural and chemical treatments as well as preventative measures to treat the problem on all fronts. Eliminating fly infestations varies slightly across species but, for the most part, no matter what the type of fly, there are a few basic principles of treatment..
With the exception of blood-sucking flies (e.g. Horse Flies), flies lay their eggs in or next to abundant food sources. Depending on the type of fly, this can range from garbage to rotting animal corpses but, regardless of what it is, as soon as you eliminate it, the flies will cease to breed in that area and the infestation will quickly move elsewhere. Most people think that when they want to get rid of a fly infestation, they need to kill as many of the adult flies that they can. While killing adult flies may offer temporary relief and may seem to lower the number of flies in the house, this will not actually help get rid of the infestation in the long run. Eliminating larvae and eggs by eliminating the flies’ food source is the only way to truly deal with an infestation. Sanitation overlaps with the previous principle. Again, with the exception of blood-sucking flies, flies feast on rotting foods, waste, and flesh. Keeping a residence meticulously clean, dry (flies love humidity), and air-conditioned will eliminate food sources and the conditions that flies love. Preventative measures keep flies out of the house and include screens for doors and windows and other ‘DIY’ solutions for keeping flies out of the home. Make sure to keep doors and vents closed as much as possible, particularly during the day and in the summer. Many have suggested hanging Ziploc bags filled with water outside doorways as the fragmentation of light may scare flies away. In addition to the methods above, adult flies can be targeted to make an infested area more ‘livable’ while you are dealing with the infestation. Mechanical means such as fly swatters, bug zappers (a UV light which attracts flies and other bugs is surrounded by an electrified cage that zaps flies when they pass through it), fly traps, and sticky fly paper can be used in conjunction with chemical control methods (foggers in closed unoccupied rooms, slow release pesticide strips, and non-residual pesticides) to reduce the adult population. Following the above principles will help you deal with most fly infestations. There are hundreds of thousands of species of flies. For the purposes of eliminating infestations, it is highly useful to know what type of fly you are dealing with, and what its food source is. In addition, each fly has a number of tricks that can be used to deal with it. Fruit flies, also known as vinegar flies, are small tan or beige gnat-sized flies with red eyes that eat sweet and fermented liquids. Syrups, sodas, and vinegars as well as old rotting fruits attract fruit flies. The female flies lay their eggs inside these materials as well as around them. The most important step in getting rid of fruit flies is eliminating these materials from the residence either by cleaning anywhere they may have spilled, throwing them out in a dumpster far from the house, or cleaning and sealing them and placing them in a refrigerator. Cover all fruit with saran wrap or place it in closed containers. Any infested items will need to be thrown out. Fruit flies are often found outside around fruit trees. When fruit ripens and falls off the tree, it ferments and attracts flies. In addition, people often keep these rotting fruits in composts. Throwing the fruits out far from the house or keeping the compost far from the house will help keep fruit flies away. An easy trick for trapping adult fruit flies is creating a sugar or dish soap trap. It is important to note that these will work only on fruit flies and other filth flies will fly by them with no notice. Take a big plastic soda, water, or other drink bottle, and cut it in half along the top. Fill the bottom half of the bottle with liquids fruit flies eat, such as syrup concentrates and vinegar. Alternatively, you can use fruit scented dish soap and a little bit of water. Sugar-water generally will not work, as it is not fragrant enough. 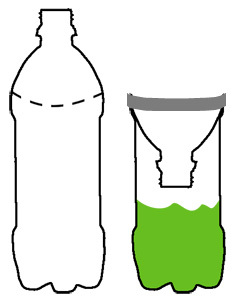 Invert the top half of the bottle and place it inside the bottom half (see the picture). Seal the bottom and top half along the rim with tape so flies will not be able to escape out of the sides. Fruit flies will fly into the bottle trying to get the food inside of it. Once in, they attempt to fly out by going straight up and are not able to fly out through the opening. The common house fly generally eats a mix of rotting garbage and animal feces. Like fruit flies, house flies lay their eggs in and around these food sources. The most important step in getting rid of house flies is eliminating these materials. Trashes must be emptied in dumpsters far from the home. Trashcans inside the house should be cleaned on the inside and outside. After this, any new trash placed inside them should be in a trash bag, and the trash itself should seal well. Any open sewage drains must be treated with repellant or chemical pesticides. Drain flies get their names from their preferred habitat. They are large ‘hairy’ flies that eat and infest sewage. They are often found in bathrooms. Drain flies lay their eggs in the material that accumulates on sinks, toilets, showers, and floors in bathrooms. Additionally they make their way into drains. As with all other flies, getting rid of drain flies requires eliminating their food source. Clean and scrub the bathroom thoroughly. Spray showers, baths, sinks, and toilets with strong chemical cleaners. Drains and pipes should be dismantled and thoroughly cleaned. 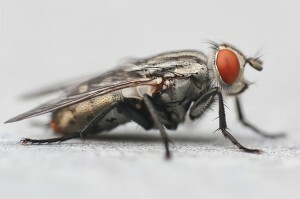 Blood-sucking flies are the most difficult types of fly to get rid of. Getting rid of horse flies is easier than getting rid of stable flies. This is because both male and female stable flies feed on blood, while only female horse flies feed on blood – the males instead consuming pollen and sap. The difficulty with these sorts of flies is that it is not possible to eliminate their food source (you!). Blood sucking flies often lay their eggs in stagnant water. Therefore, if there is a water source near the infestation (e.g. water for livestock), invest in a system to ensure the water is refreshed often. There are several pesticides that can be used on livestock but are not recommended for use on people such as CB 80 Pyrethrum Aerosol which can fend off horse flies, stable flies, and deer flies. Gentrol Aerosol IGR (Insect Growth Regulator) is an aerosol, which prevents young flies from maturing into adult flies and thereby stops their ability to reproduce. This can be useful in eliminating infestations in the long run and preventing re-infestations. In addition, placing several horse fly traps on the premises can help control the population (these traps are designed specially for ‘visual hunters’ such as horse flies). Fly control on farms is far more challenging than in the home. Though treatment is more complex, the basic principles are exactly the same. Cleaning feed spills, dairy leaks, and never allowing manure to accumulate close to livestock are important places to start. An excellent resource for anybody looking to control flies in an agricultural setting is this farmer’s bulletin, published by the USDA nearly a hundred years ago. Though old, this resource is still relevant and a great place to learn how to deal with fly infestations on a farm on your own.